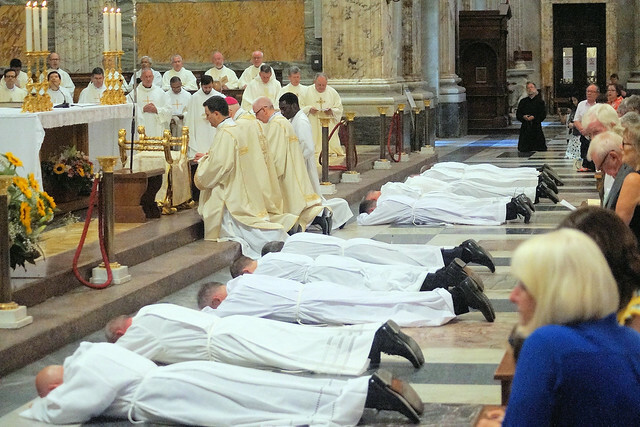 Three Diocese of East Anglia seminarians were ordained as deacons in Rome on Wednesday (June 13) in an historic Mass at St Paul’s-outside-the-Walls Basilica led by Bishop Alan Hopes. Keith Morris reports. Alan Hodgson, Paul Spellman and Mike Brookes were among 11 students from the Pontifical Beda English College in Rome to be ordained as deacons and it is believed to be the first time three seminarians from East Anglia have become deacons on the same day in Rome. Bishop Alan was accorded the significant honour of celebrating the Mass, ordaining the deacons and preaching in the Basilica. It is believed to be the first time an East Anglian bishop has done so at a major Basilica, all four of which are in Rome. The ordinations were followed by a celebration buffet for 300 staff, students, and family and friends of those ordained back at the Beda College. The ordination marks the end of the academic year and students will now return to their dioceses for pastoral placements. Referring in his homily to the portraits of popes, and the pallium each one is wearing, lining the walls of St Paul’s, Bishop Alan said: “Like the priest, the bishop, the Pope, you too are called to be associated with the work of the Good Shepherd. “From today you will have a part to play in the care of the Good Shepherd’s flock. You will even begin to take on yourself, with Christ, the burden of his people and their needs, in your prayers, your sacrifices and pastoral commitment. This is the sweet yoke of Christ to which he invites all those who would follow him and minister with him to carry. “In order to begin to carry the Lord’s flock you will need broad shoulders, the broad shoulders of Christ himself. This has been the point of your seminary training thus far. You have come to the Beda as men already mature in years and the valuable experience of a profession. The job of the seminary is to make of you men who are mature in Christ – men who are conformed to him in such a way as to be shepherds with him,” said Bishop Alan. “Many will look at you in disbelief and decide that you are throwing your lives away, throwing away the opportunities and freedoms and privileges that you have so far enjoyed.